It was an amazing weekend for the Colts at the Mt. Sac Relays! Katelyn Vuong broke her own school record in the 800m running a solid 2:16.33! On the boys side the 4x400 relay team set a season best time along with the 4x200 relay team. One of the highlights of the day was watching Michael Norman run one of the fastest times ever in the 400m and some of the team getting autographs and taking this pic with the outgoing Norman. Go Colts! Covina Wins Valle Vista League Titles! 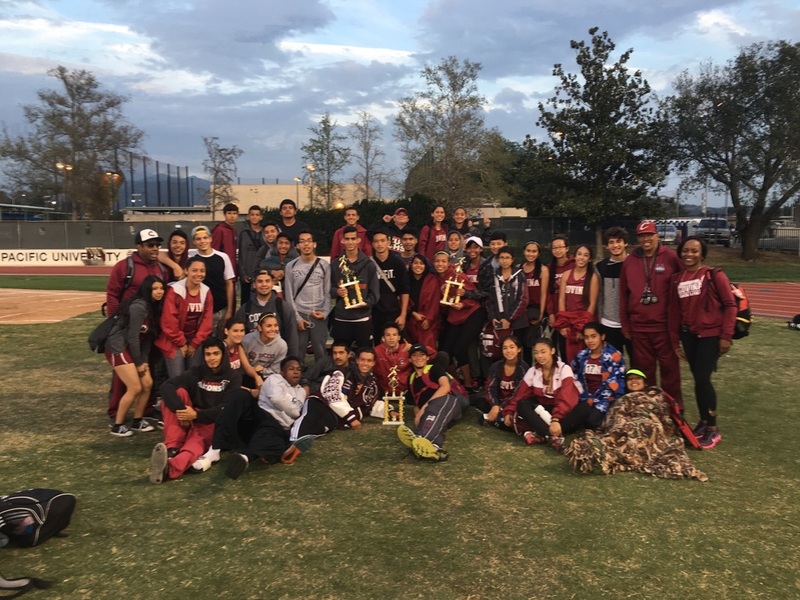 In the final dual meet of the season, the Covina Colts boys and girls track teams defeated Wilson to secure their 2019 league title! It was a solid day all around for the team and we would like to congratulate all of the athletes and staff and also thank the parents for their continued support during the season! Go Colts! Colts Steam Through BP and Shine at SGV's! 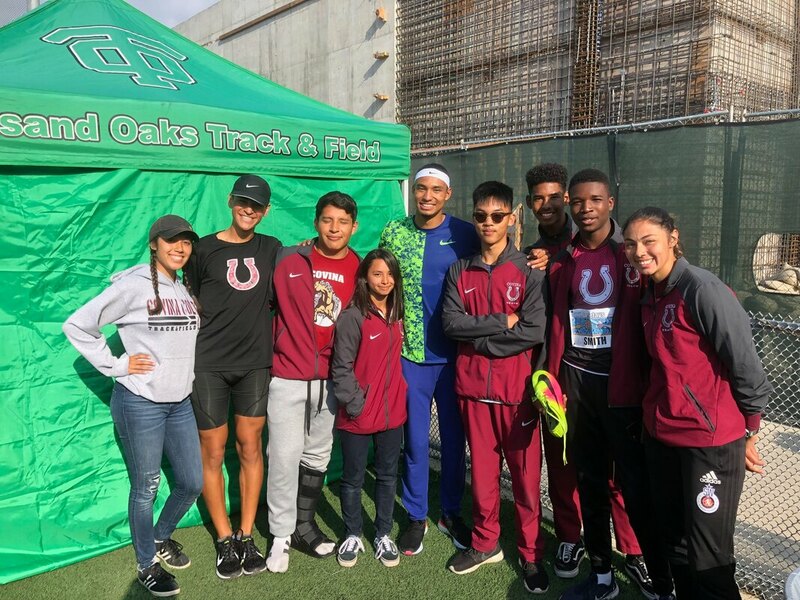 The Colts Track Team handled business in a quiet league meet at BP Thursday but truly came to shine on Saturday at the 14th Annual SGV Track & Field Championships! The girls FS team took 4th, girls varsity placed 3rd, boys varsity were 3rd, and the boys FS squad took 2nd. There were many outstanding Colt performances, but sophomore Maya Rush again stole the spotlight by breaking the meet record in the 400m with a 56.56 and in doing so also broke one of the longest standing school records at CHS! Next week the team will host Wilson on Tuesday and then a handful of athletes will be competing at the Mt. Sac Relays on Saturday. It was ladies night at the Arcadia Invitational! All of our qualifying girls who made it into the prestigious meet broke school records! Katelyn Vuong broke her own school record in the 3200m by running an impressive 11.00.1! She also anchored the sprint medley relay team to a school record by over 4 seconds! Team members Charisma Benitez, Julia Cruz, and Dulce Aguirre added their names to the record board with her. 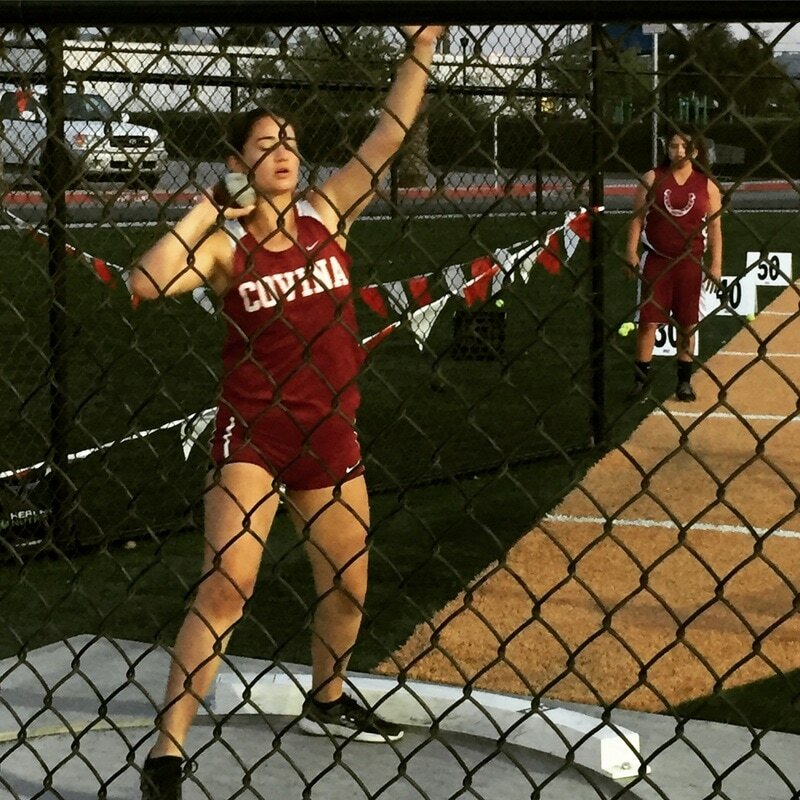 Sophomore Maya Rush stamped her name into the record books too by scoring the highest heptathlon score ever by a Covina athlete and taking 4th in the grueling two day event. 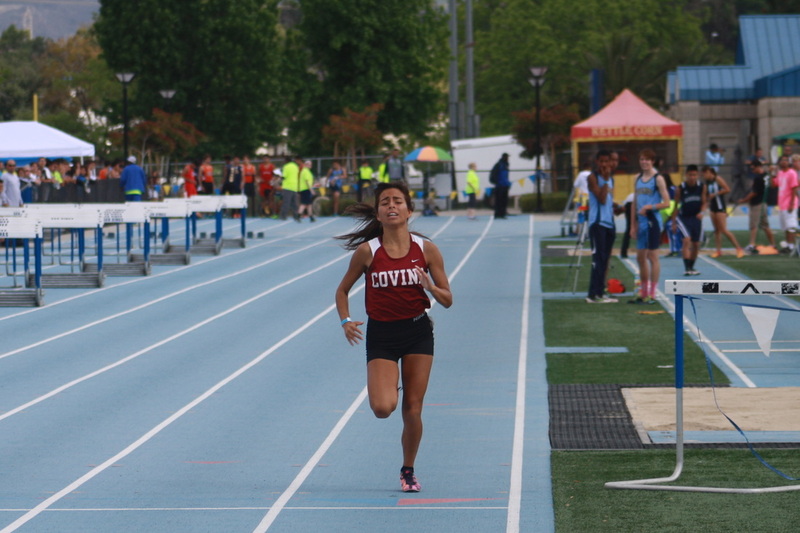 The Colts hosted the 28th Annual Covina Invitational at CDF March 30th. The team placed in the top four in all four divisions! It was an outstanding day for one of the biggest invitationals we ever hosted! Thank you to all of the participating teams and athletes. A special thank you to all of the Covina High staff, parents, team members, and volunteers that helped make the meet a success. Link to Covina Invite Results! Colts Go In N Out Over San Dimas! 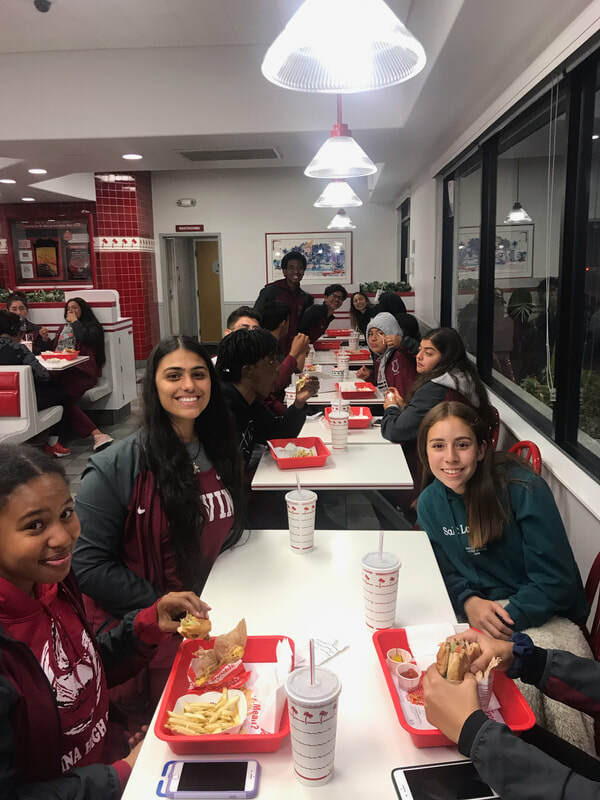 After defeating San Dimas on all levels Wednesday and managing to avoid all storms cruising through Southern California, the Colts celebrated at In N Out which was especially special since it was "Coaches Treat!" Next week the Colts take on Northview on Tuesday and then have the 28th Annual Covina Invitational on Saturday March 30th. Qualifier is a BUSY Hit! The Qualifier on 3/16/19 hosted nearly 40 schools in great weather trying to get outstanding marks for tougher meets down the road. The Colts also had an outstanding day and received many great performances themselves. Below is a link to the results. Colts Take Down Rowland in Exciting Dual! The Colt defeated Rowland on the boys and girls side taking the driver's seat towards a league championship. The boys match came down to the 4x400 relay where the winner would be crowned victorious. 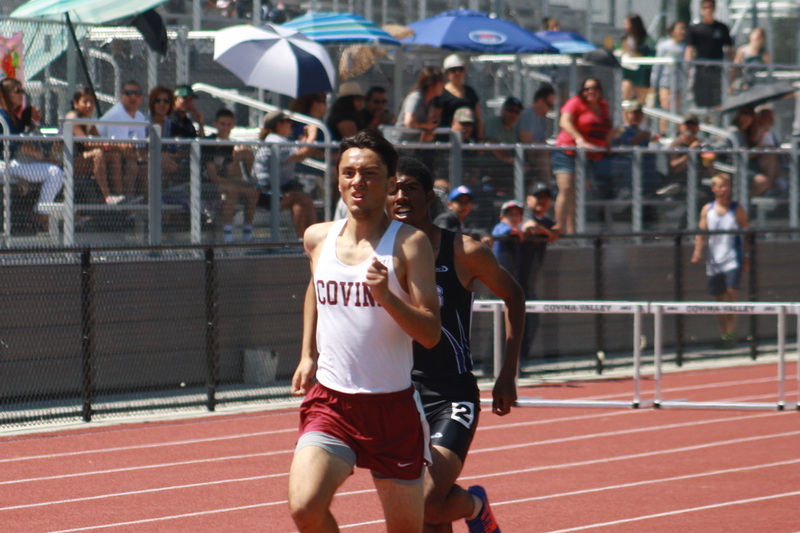 Covina won the race handily clinching the victory 69-67. The girls team won 76-60 with many great events contested through the day! The QUALIFIER UPDATED TIME SCHEDULE/MEET INFO! Covina Retains District Champ Titles! The Colts were victorious on all three levels vs. district rivals Northview and South Hills! On a cool afternoon the team was able to fend off our neighbors from South Hills in a battle! Results are below. This Saturday the team heads to Vista Murrieta for the Saddle Up invite! Go Colts! It was a beautiful brisk Saturday afternoon with the Colt Classic on Saturday. Our own Colts had a terrific day with some excellent marks. Highlighting the day was the 3rd place finish in the meet by the varsity boys and the 1st place finish by the frosh-soph boys team! FULL RESULTS BELOW! Colts Host and Shine in Season Opener! The 2019 track season opened with a sunny but chilly day and the Colts were still able to heat up the track! With visiting South Pasadena, Los Altos, Walnut, Damien/St. Lucy's in attendance the team had some exceptional performances. Katelyn Vuong highlighted the day by breaking her own school record in the 800m with a time of 2:18.16! Aaron Rodriguez also had a personal best of 14'0" in the pole vault to start his season! The Colts continue action next Saturday as we host nearly 30 schools at the Colt Classic! RESULTS ARE BELOW! Covina Track 2019 MEET SCHEDULE! Colt Day Color Run Gets Wet! Rain couldn't dampen the Covina High on our annual Colt Day. The team and school were able to get through the day getting color tossed on them along with a steady rainfall. Overall, thanks to all who helped make Colt Day a success! Now it's time for our season to begin on 2/16/19! Our online Covina Track & Field store is now open until December 17th! Go to www.bsnteamsports.com and use the access code COVINATNF to begin! Covina Hosting Winter All-Comers Qualifier on January 19th! Come and join us at the Winter All-Comers Qualifying meet at Covina District Field on January 19th! This is a great opportunity to run in a quality event at a quality facility! Information is below! Preseason Track is Kicking It! Track is off and running prepping for the 2019 track season! A combination of strength training, weight-room, and plyometrics is getting this group strong and ready to aim for a 2019 league championship! Go Colts! Katelyn Doubles Up and 4x400 All CIF! What a year for Katelyn! She placed in both the 1600 (4th) and 3200 (6th) at CIF D3 Finals and broke all three school distance records at CHS in only her sophomore year! She also was part of the school record distance medley team this year. Coupled with her outstanding GPA, the sky is the limit for Katelyn Vuong! The boys 4x400 team of Jalen Robledo (12th), Ryder Yriarte (10th), Daniel Lopez (12th), and Anthony Ramirez (10th) also stepped up their game. The boys set a seasonal personal best by three seconds to take 6th place in the D3 4x400m relay! Next up, the track banquet on 5/24 Thursday at the district field. Awesome season to all! Colts Qualify to CIF Finals! Katelyn Vuong continued her awesome sophomore season by qualifying for CIF Finals in two events! Katelyn will run the 1600m and 3200m next Saturday at El Camino College. The boys 4x400 relay team of Anthony Ramirez, Jalen Robledo, Daniel Lopez, and Ryder Yriate also won't be left out of the fun as they also qualified! Good luck in CIF Finals Colts! Covina Hosting FS Meet on 4/21! Join the Colts for another outstanding day of competition on Sat. 4/21/18 at Covina District Stadium! Info to the right! Girls Distance Medley Sets School Record at Arcadia Invite! 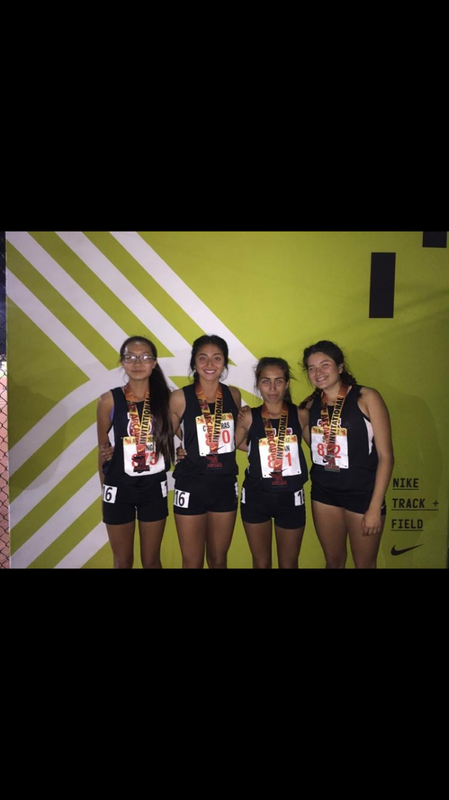 The girls distance medley team of Katelyn Vuong, Amy Escobedo, Rosaly Castorena, and Vanessa Gracian joined up with the best of the best at the Arcadia Invitational on Saturday and in doing so set the school record in the DMR! Way to go Lady Colts! Covina Invite Is Another Success! Thanks to all of the Covina Track Staff, parents, athletes, and volunteers that helped make the 27thg Annual Covina Invite a success! We appreciate all of the schools and athletes that came to participate and we hope to see everyone next year again! Covina Topples Northview in Dual! On Tuesday the Colts faced district rival Northview in their second league meet of the season. Covina was victorious on all levels. Led by their overwhelming depth in hurdles and the field events, the Colts cruised to victory. Next up for the squad will be the 27th Annual Covina Invitational on Saturday! Boys Take 2nd at Chino Relays! The Colts started off the week on Tuesday with a sweep on all levels against San Dimas. On Saturday 3/24/18, Covina made an appearance at Chino Relays with the Boys Varsity taking 2nd place overall! We had some very great marks at Chino Relays, including the Boys 110HH Shuttle Hurdles running the 4th fastest time in the state this year! Finishing off the day, Vanessa Gracian and Katelyn Vuong ran at night in the APU Distance Meet of Champions. Colts Have a Record Breaking Week! The Colts started off the week with a great showing against West Covina and Nogales on Tuesday. The weather was cold, but that didn't stop them from performing. 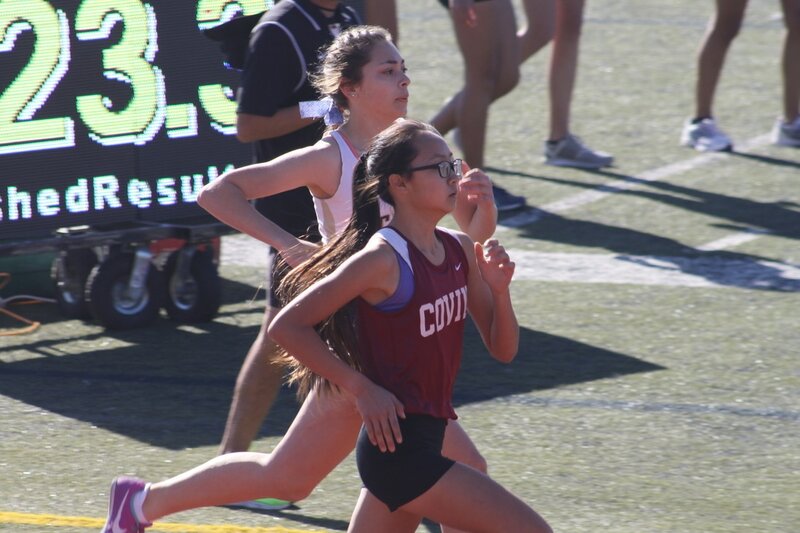 On Saturday 3/17/18, the Colts put forth excellent times at The Qualifier, including Katelyn Vuong's new Girl's Varsity 800m school record of 2:20.5! Rain Can't Stop a Classic From Running! Over 20 school participated in the 11th Annual Colt Classic at Covina District Stadium on Saturday 3/10/18. The Colts were victorious in the boys FS division easily taking the 1st Place trophy. Weather was a slight drizzle for most of the day and in the evening teams were still able to produce many more good marks. Colts Continue Covina Valley Dominance! 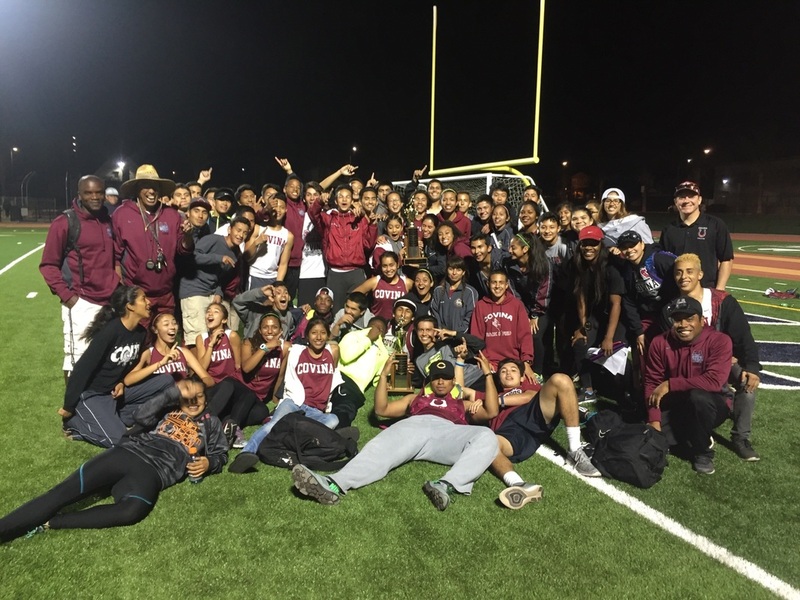 Covina High continued to prove they are the best track program in the CVUSD by dominating all levels of the Covina District Track meet with Northview and South Hills High Schools. The team was led by its dominating depth and numbers and proved too much to handle for their opponents. The team will continue this Saturday hosting the Colt Classic at Covina District Field. Results from this meet are below. Go Colts! Gracian Sets Records at Saddle Up Invite! On a cold beautiful day in Murrieta Vanessa Gracian set two school records on her first meet of the 2018 Track Season! Vanessa broke the 1600m and 3200m records en route to a the fantastic day. Overall, the Colts had a nice opener with many strong performances. The team continues the season on Tuesday with the C-VUSD meet with South Hills and Northview. Covina All-Comers This Sat 2/24!!! Join us for the final tune-up of the 2018 Track Season! Gracian and Vuong Give Heads Up for 2018! 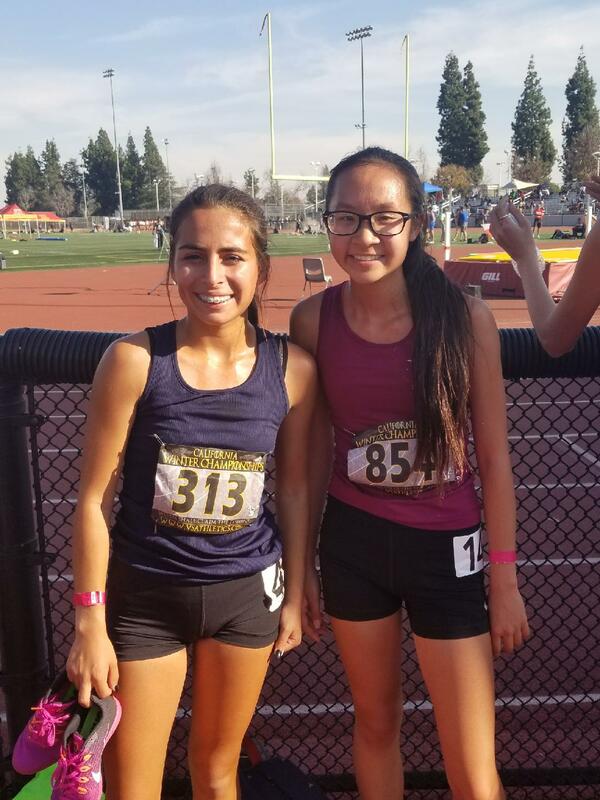 Senior Vanessa Gracian and sophomore Katelyn Vuong both had great performances at the California Winter Championships on Saturday. Katelyn had personal bests in the 1500 and 3000 while Vanessa took 6th in the 1500 and 3rd in the 3000. Both should have promising seasons with an early great start! Winter Qualifier Breezes Through Covina District Field! 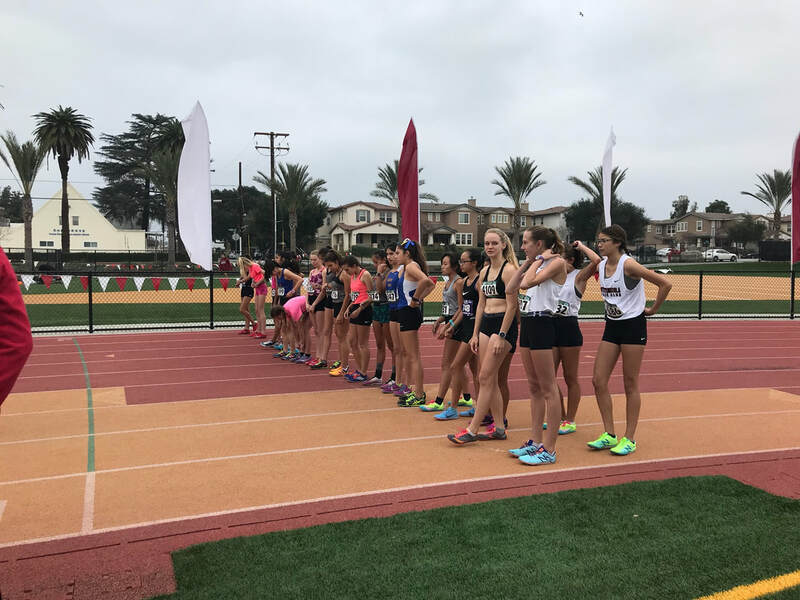 With over 400 athletes competing in our first practice meet of the year, the Covina Winter Qualifying meet for the California Winter Championships was a huge hit! The Colts had 9 qualifiers that will participate in the meet next weekend at Arcadia High School. Results link from the meet below. 4th Annual COLT DAY is Coming Up! Covina High School's annual community event COLT DAY is on February 3rd, 2018 from 9am-12pm. Join us for the Pancake Breakfast, Food Carnival, Live Music, Community Booths, and most importantly our Cancer Awareness Walk. To register for the walk please use the form to the right. Hope to see you there! As part of the Winter Track Championship series, CHS will be hosting and participating in this qualifying meet on February 10th, 2018 at Covina District Field! For those athletes fortunate enough to qualify, the Winter Championship meet is on February 17th! Below is meet information. Colts to Co-Host Track Camp December 28th & 29th! 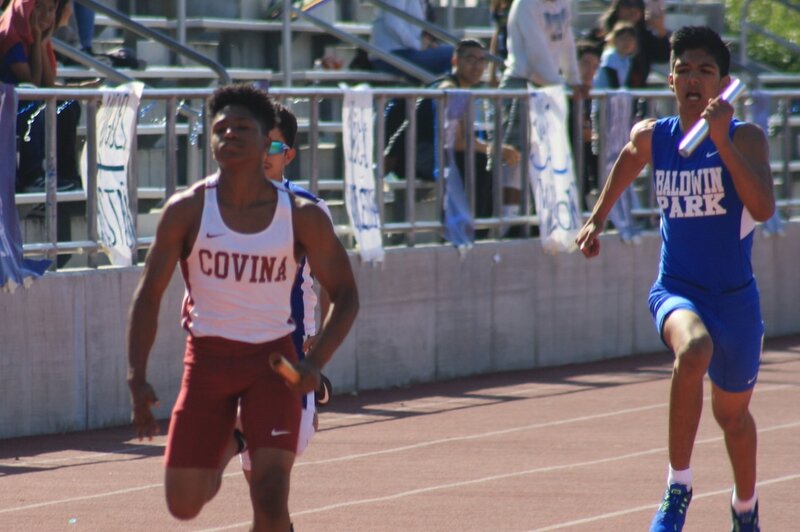 Covina High will be hosting multiple all-comers meets and track invitationals for the 2018 Track Season. Our first all-comers meet will be the winter qualifier meet on February 10th at Covina District Field. We will also host another all-comers meet on February 24th at CDF. The Cougar Classic will now be the Colt Classic at district field on 3/10/18. The Qualifier will be 3/17/18 and the Covina Invite is on 3/31/17. We will also be hosting a frosh-soph championship meet April 21st 2018. For more information click on the Hosted Invitationals/All Comers tab on the menu bar. We hope to see you at our invitationals. It's always an extra pleasure when our track athletes get special recognition! This year, Natali Contreras and Hakim Williams were named Athletes of the Year for the Class of 2017. Their accomplishment encompasses their efforts over the past four years and they have represented the best athletically for their class. 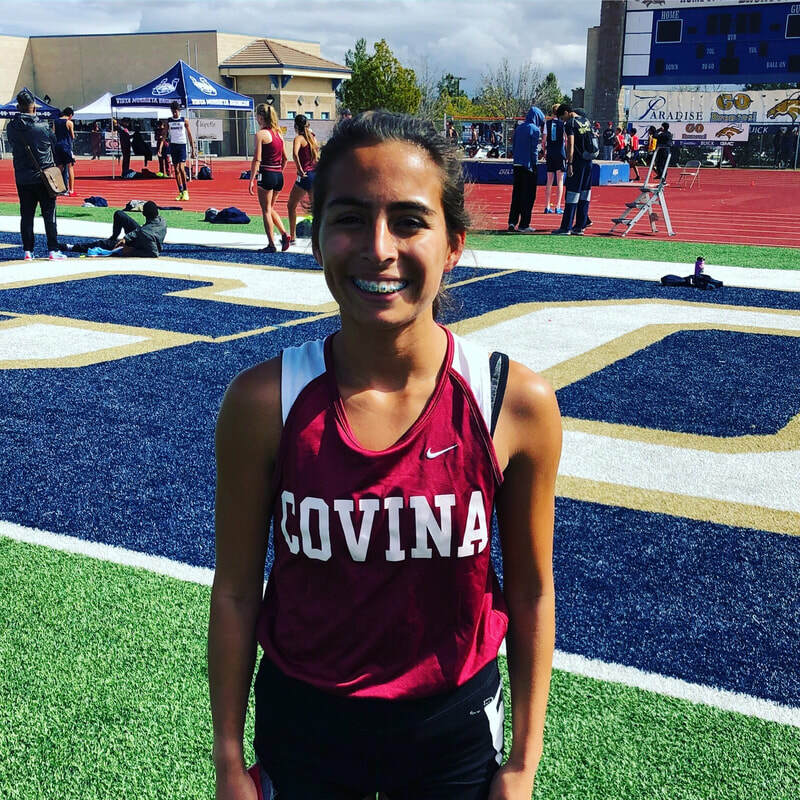 Natali led her cross country team to three straight state meet appearances and helped Covina Track win league all four years at CHS. Hakim was the Valle Vista League MVP in track the past two season and was also a standout on the football team. Natali will continue her running career at Azusa Pacific University and Hakim will continue his career at Whittier College. The 2017 Banquet Caps A Great Season! Thank you to all who helped make the 2017 Covina Track & Field season one to remember. We really have a lot to be proud of as well as to look forward to. This year we granted $2,200 to our graduating senior track athletes headed to college for the "Run For Your Books" scholarship. Good luck to our 27 graduating seniors, thank you to our 20 coaches and staff, and 2018 will be here before we know it! Hakim Williams and Nick Kalmar Place in CIF Finals! The Colts had two representatives qualify for CIF Finals! Finalist Hakim Williams (110HH, HJ) and Nick Kalmar (PV) aimed for CIF glory! Senior Hakim ended up taking 4th place in the 110 hurdles and also finished 7th in the high jump. Sophomore Nick Kalmar took 6th place in the pole vault leaping a personal best 13'0''. Congrats to both athletes! Colts Qualify 21 Athletes To CIF!!! 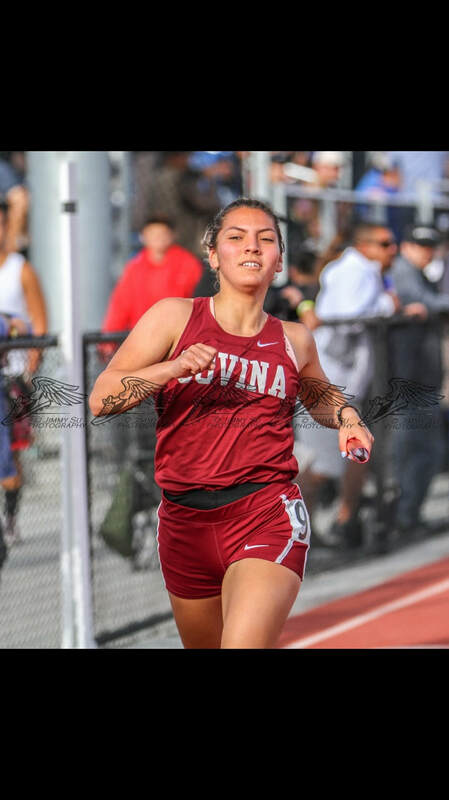 The Covina Boys and Girls team led a large group into the Valle Vista League Prelims and Finals this week and did what they were poised to do and qualified 21 athletes into the division 3 CIF prelims to be held at Estancia HS next Saturday. 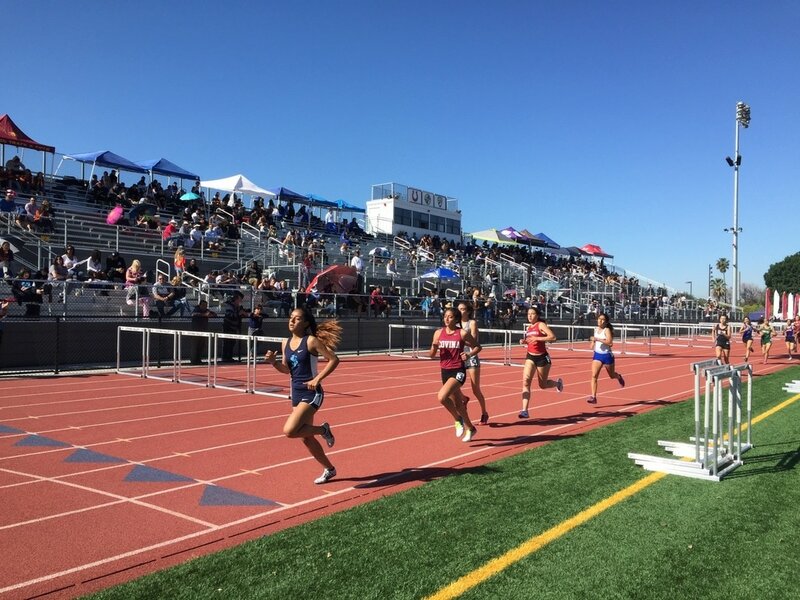 League champions were Rosaly Castorena (400m), Darien Jones (Discus), Vanessa Gracian (1600m/3200m), Katelyn Vuong (800m), Melissa Mendoza (HJ,PV), Hakim Williams (HJ,300H), and the girls 4x100 relay team of Mendoza, Paige Marquez, Laurelle Ojeda, and Jailene Alvarez. Good luck Colts! 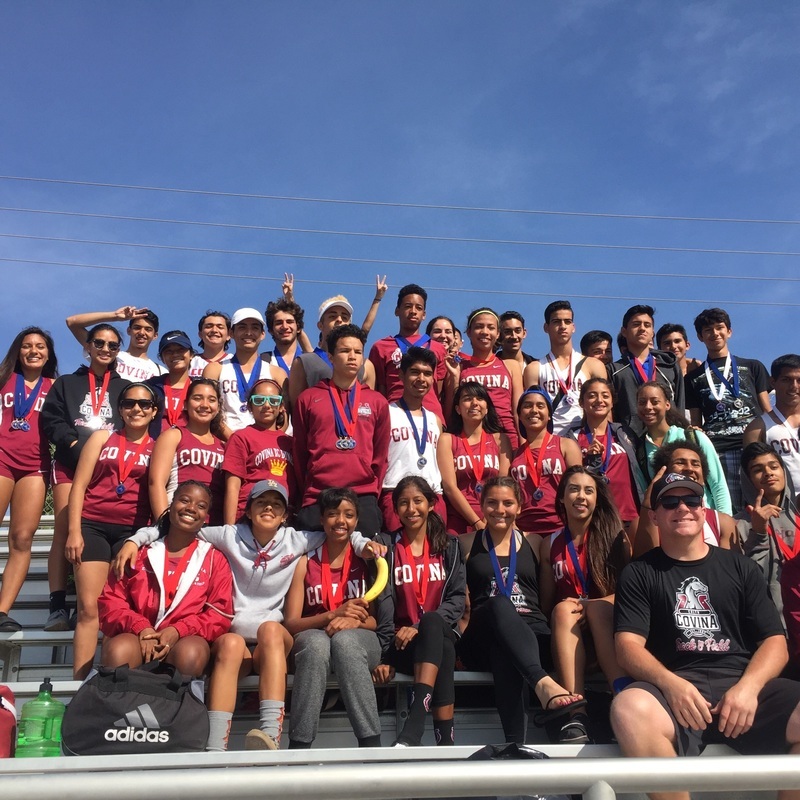 In a repeat of last years contest, Rowland and Covina split the Valle Vista League track championships with Rowland capturing the boys title for the second year in a row and the Covina girls winning the title for their sixth title in a row. It was an outstanding meet with great performances on all sides. Colts Beat Wilson and Rock SGVs! The Covina High track team set up a showdown for Thursday the 27th between undefeated Rowland by beating Wilson on all three levels. The meet vs. Rowland will be for the championship on all levels. The Colts then went to the SGV championships where the performed exceptionally well in preparation for the league championship and CIF season ahead! One of the most prestigious track meets in the nation is in our own backyard! The Colts were fortunate enough to qualify two girl relay teams into the meet. The girls 4x1600m relay team of Natali Contreras, Izzy Silva, Katelyn Vuong, and Vanessa Gracian rolled to a second place finish Friday night in the seeded girls race. The distance medley relay team of Rosaly Castorena, Silva, Gracian, and Contreras came back on Saturday to better the CHS school record by two seconds! Covina Invite Is No Joke! 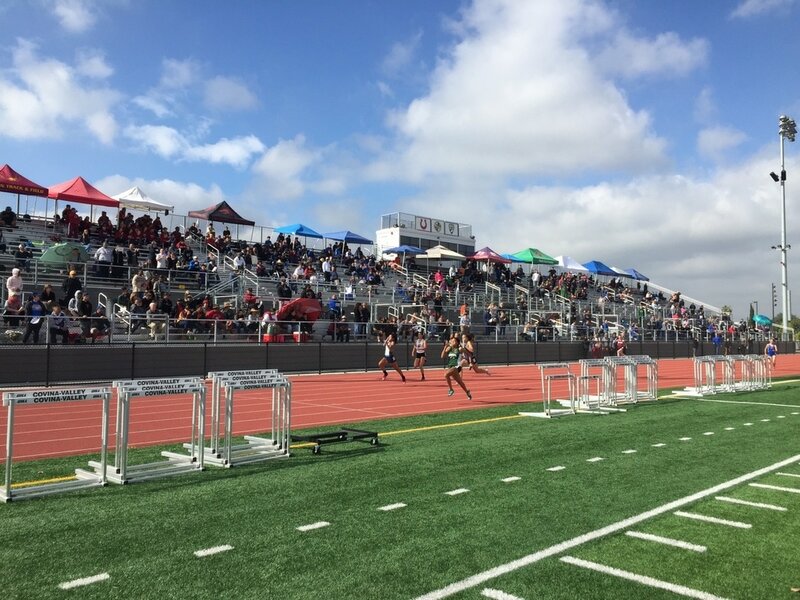 April Fools Day provided a great setting and especially great weather for over 1,200 athletes at the 26th Annual Covina Invitational. Thank you to all staff, athletes, and parents that helped make the meet another huge success! Results link is below. In the third league meet of the year, the Colts easily disposed of rival Northview on all three levels. The team now prepares for Saturday's 26th installment of the Covina Invitational on Saturday April 1st. Qualifying Marks at the Qualifier! 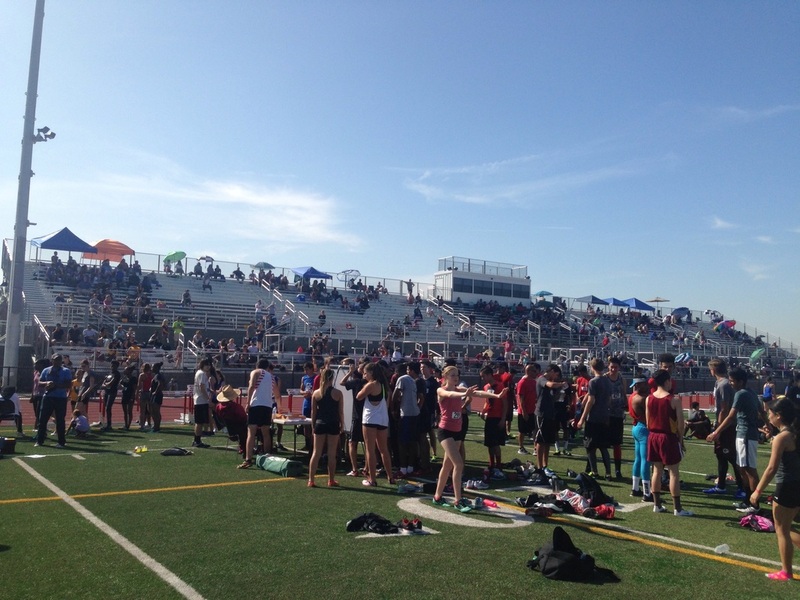 Great weather and awesome competition provided a sweet opportunity for athletes from all over Southern California to participate in Covina Highs "The Qualifier" Invitational. Over 1,250 athletes showed up and battled in the various relays and individual events for medals and making an effort to get solid marks for meets down the road. Thanks to all who participated and to the many volunteers that made the meet a success. Results link is below. Colts Open League With Two Victories! 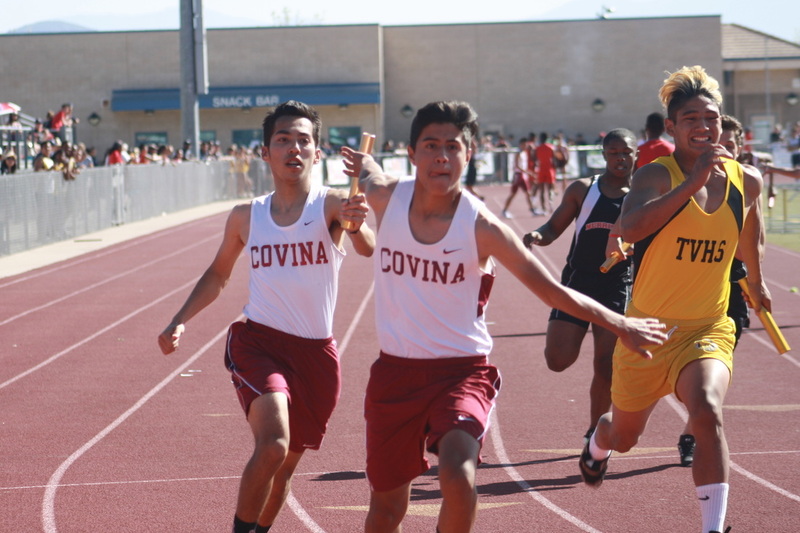 On Thursday 3/23 Covina Track opened up league with a double dual meet vs. San Dimas and Baldwin Park. All three levels were victorious and start the season 2-0. 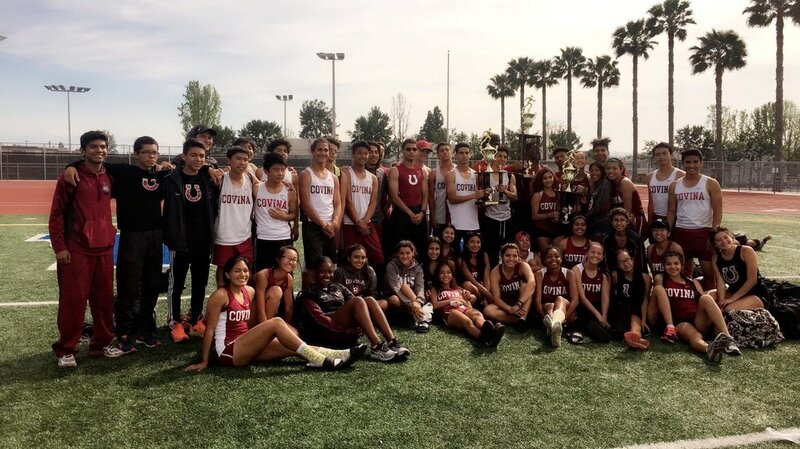 Once again the Covina Track team dominated division two of the Chino Relays by capturing first place in the boys and girls varsity divisions! The team had numerous outstanding performances and places led by the distance girls team establishing a new school record in the 4x800m relay! Natali Contreras, Izabella Silva, Rosaly Castorena, and Katelyn Vuong hold the new title! This week the Colts open up league competition vs. San Dimas and Baldwin Park on Thursday and host our "The Qualifier" invite on Saturday at Covina District Field. Covina Muscles by West Covina and Nogales! 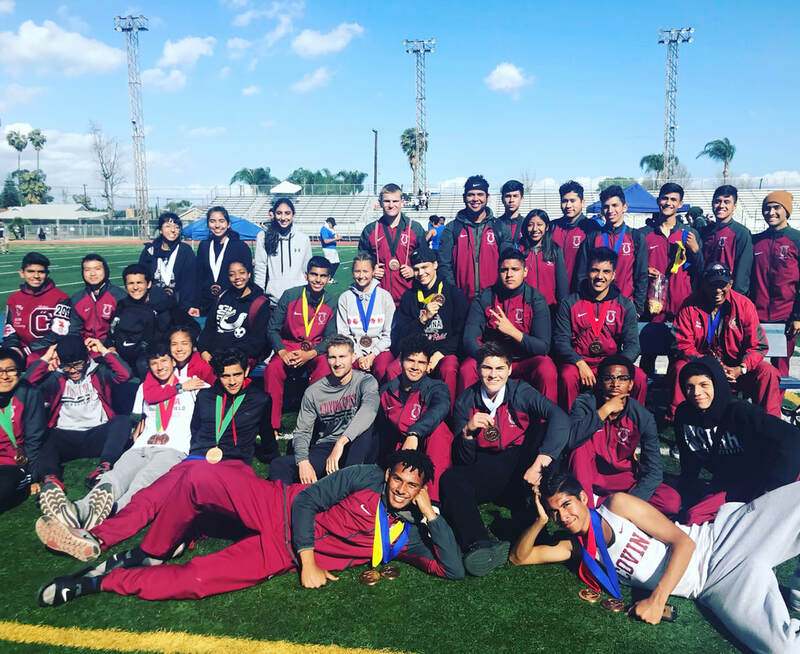 The Covina Track team continued with its friendly rivalries with former league foe Nogales and next door neighbors West Covina. With great competition on all ends the Colts came up victorious over both teams on the boys varsity, girls varsity, and frosh-soph boys divisions. This Saturday, the team heads to the 66th Annual Chino Relays where the team has always had success! Monrovia brought a strong sprint team to Covina District Field on Thursday, but it was the overall team strength across the board of the Colts that prevailed. CHS won all four divisions over the Wildcats in what continues to be a solid rivalry! Colts Place at Cougar Classic! The Cougar Classic went off without a hitch at APU this past Saturday. 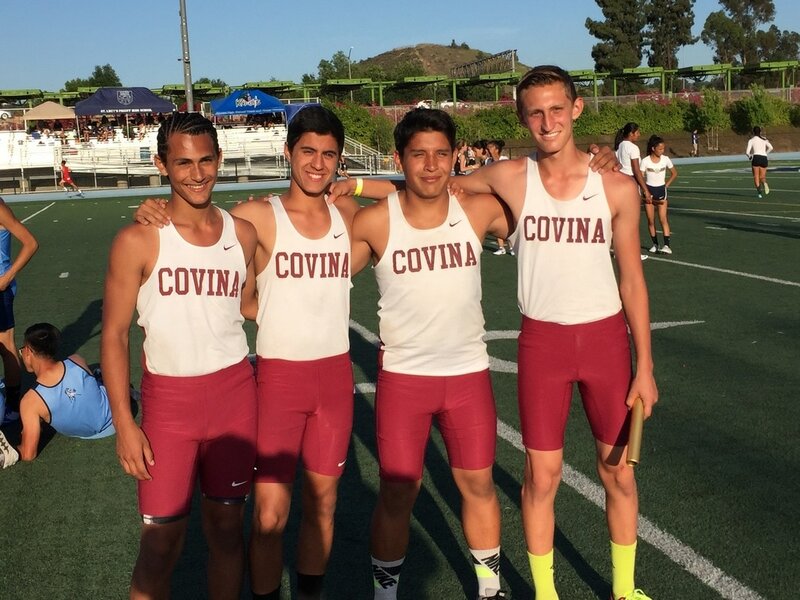 Covina fared exceptionally well in the 35 team meet. The girls FS team took 2nd, boys varsity placed 3rd, and the boys FS took 4th overall. Results link to Cougar Classic! Colts Keep the Trophy, Capture District Meet Title! 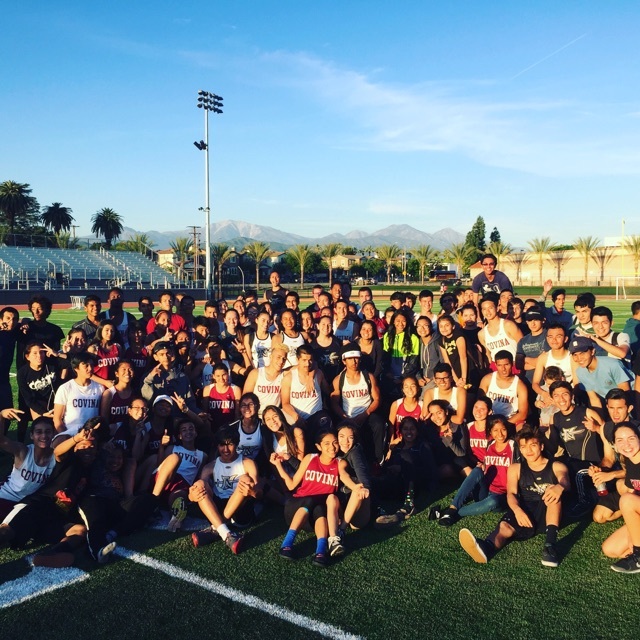 In the annual Covina Valley USD district meet, CHS was able to thwart a strong attempt by rival South Hills and retain the title as best track team in the district. The boys team won by a slim two points while the girls varsity and boys FS won handily. Below are a link to the results. COUGAR CLASSIC UPDATED TIME SCHEDULE!!! Colts "Saddle Up" at Vista Murrieta! 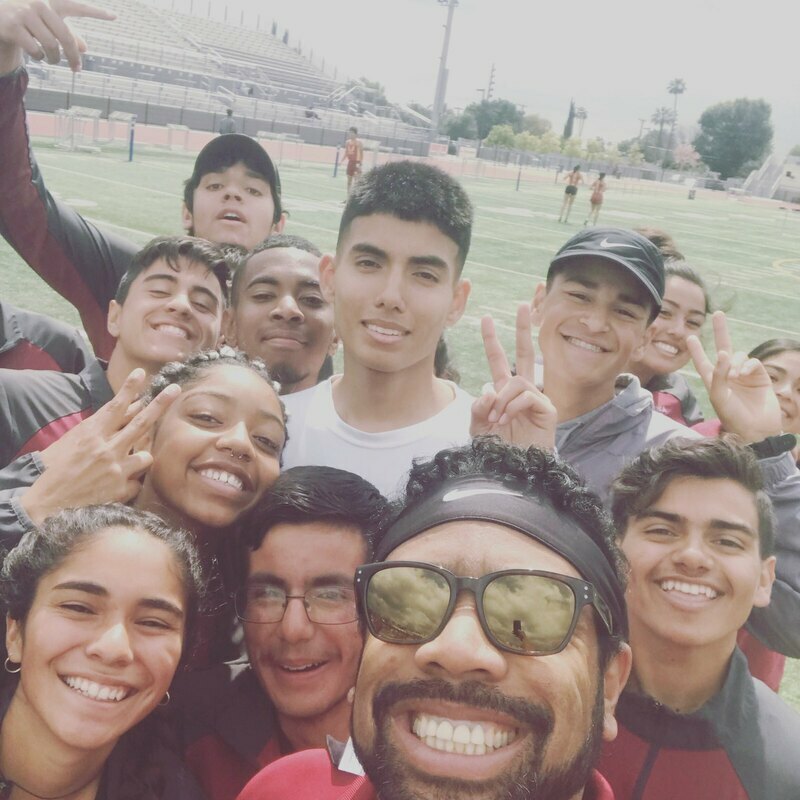 The Covina Track squad opened up the 2017 track season with a visit to Vista Murrieta High School where former Covina Track sprint coach Coley Candaele has led them to national prominence. Katelyn Vuong highlighted the day by breaking school records in the 1600m and 3200m for a freshmen! Hakim Williams led the boys team placing in all four of his events. Nick Kalmar also had a great day breaking the meet record in the FS pole vault at 11'8". This week the Colts take on Northview and South Hills in our annual district meet at Covina District Field on Thursday. Below is a link to results from the Saddle Up Invite. Covina Twilight All Comers Results! Rain Doesn't Slow Down Colt Day 5K! With a wet morning seemingly dampening the day, 5K racers and walkers still ventured out to CHS to sprint through and around the school! 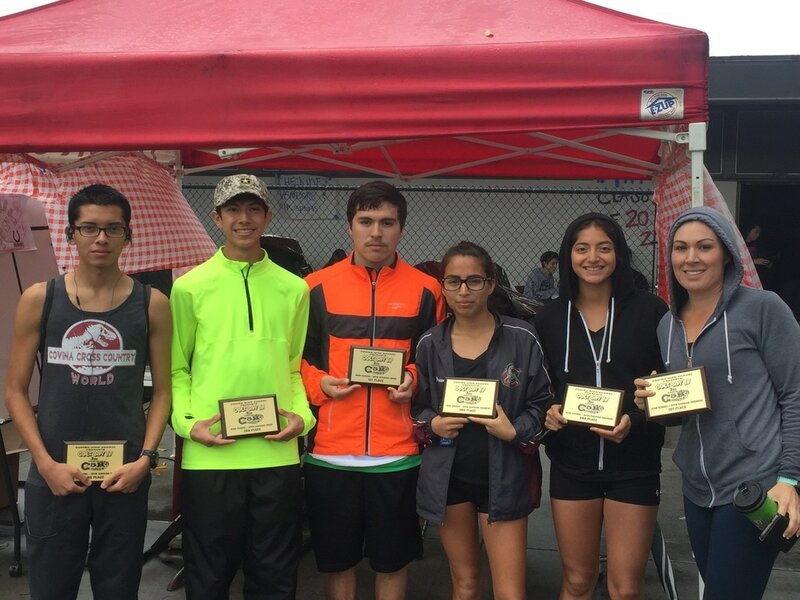 Covina High athletes dominated the race and mother son combo of Yesenia Brockett and Jose Pineda came home with first place plaques! Covina All Comers #1 Starts off the Pre-Season! 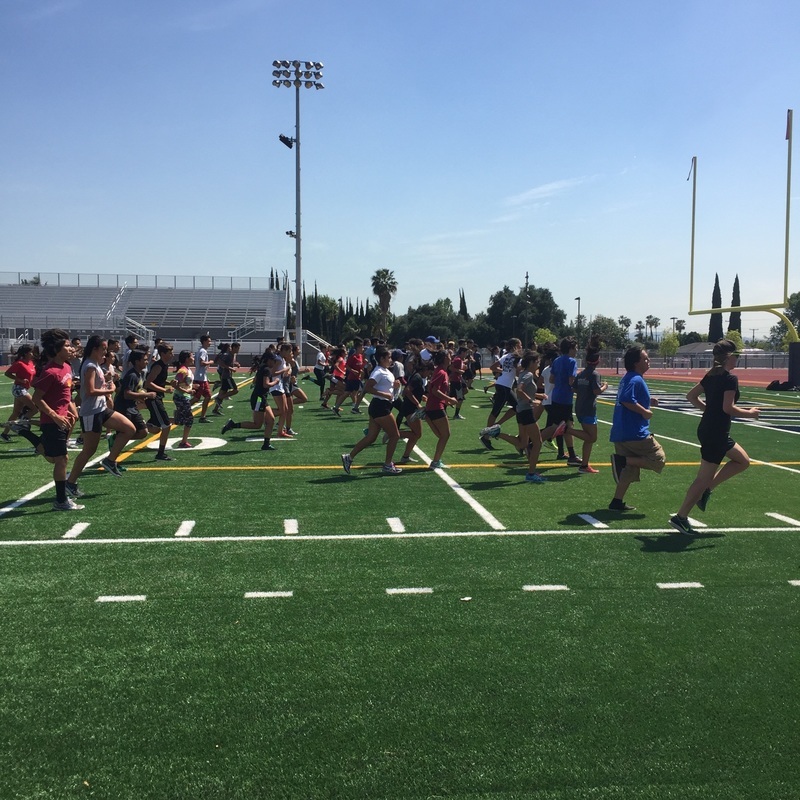 About 400 track athletes from all over Southern California came out to Covina District Field on a brisk beautiful Saturday morning to get an early start on the 2017 track season. Thanks to all that visited and competed, results are below! Join the Covina Colts for our annual community event "COLT DAY 5K and Cancer Walk" on February 11th, 2017. We will be fundrasing once again for Relay for Life and hoping you can be a part of the 5K, live music, food, and fun! Athletes, sign up on REMIND for our 2017 season! Click the HOSTED INVITATIONALS TAB for 2017 COVINA HOSTED MEETS! 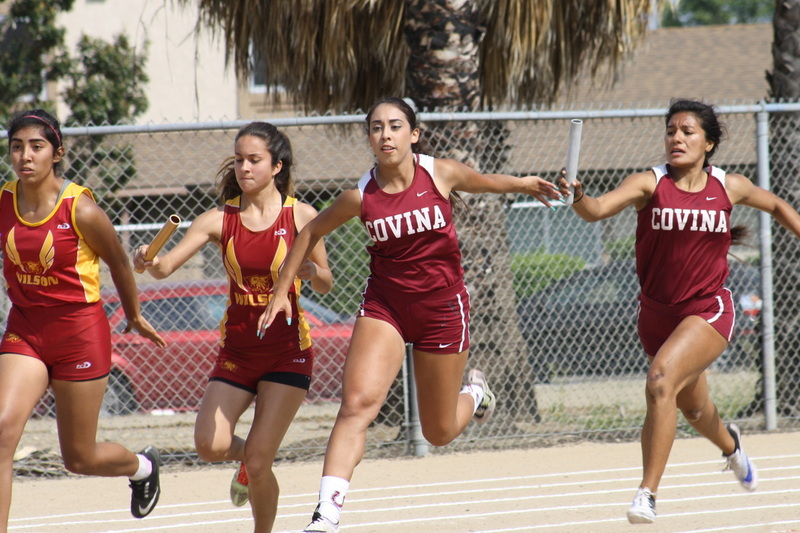 Covina High Track & Field hosts many track meets through the year. We hope your teams will be able to join us in a well run meet and great competition. 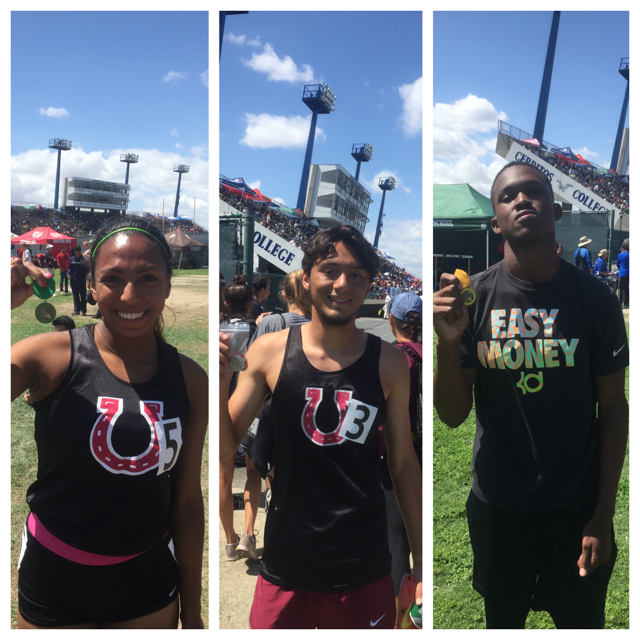 Three More ALL-CIF Athletes for Covina! 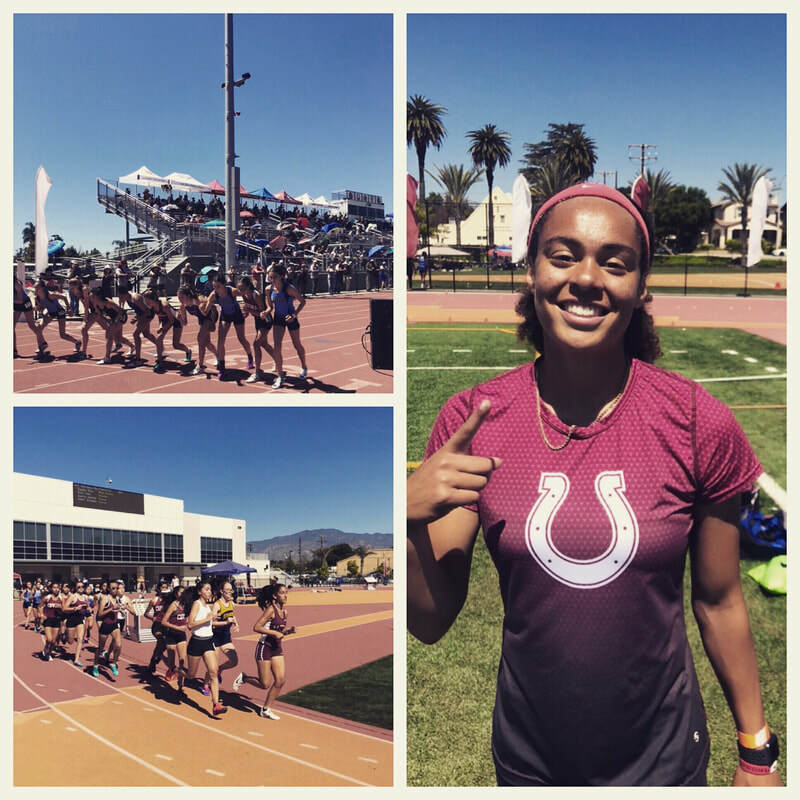 CIF Finals, the championship for Southern California Track & Field which is arguably the strongest section in America took on three Colts this past Saturday. All three were able to place in their respective events earning ALL-CIF Status. Daniel Salazar was the teams highest placer finishing 3rd in the 1600m and also 8th in the 800m. Demi Marine took 4th in her final high school meet also in the 1600m and Hakim Williams had a valiant 5th in the 110HH. All three had much to be proud of this track season and it was a solid finish to a fine season for all. Williams, Salazar, and Marine head to CIF Finals! Three Colts have advanced to CIF Finals to be held on Saturday the 21st at Cerritos College! Hakim Williams qualified with the 2nd fastest time of the day in the 110HH with a personal best of 14.90. He was followed by 1600m qualifiers Demi Marine (5th overall) and Daniel Salazar (3rd overall). Many other Colts had strong performances but were just off qualifying. Hope Duenas through a lifetime best of 111' in the discus but was 15th and missed the top 9 spots to move on. Good luck to Hakim, Demi, and Daniel on Saturday!!! League Finals has no disappointments as the team placed 20 athletes in the finals competition! League Champions were Daniel Salazar (1600, 800), Hakim Williams (300H,110HH), Demi Marine (1600, 3200), Hope Duenas (Shot Put, Discus), Charley Johnson (3200), Charisma Benitez (400), and Nick Valencia (Shot Put). The team will continue on to CIF Prelims next Saturday at Estancia High School. Full results are below! San Dimas and Nogales Fall to Covina! 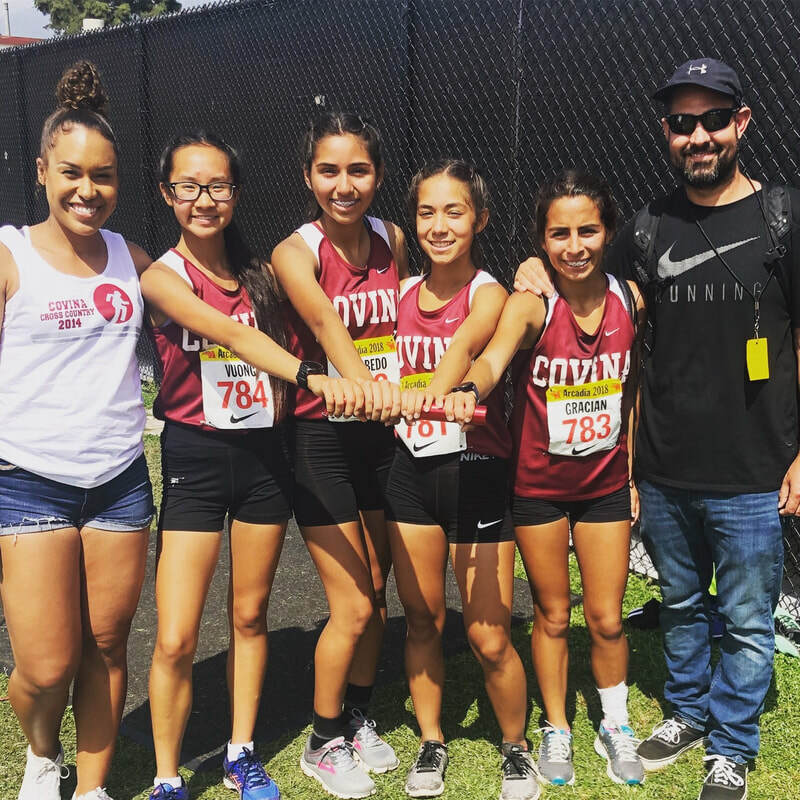 The Covina Girls team captured their 5th Valle Vista League title in a row by defeating Nogales and San Dimas in the teams final meet of the dual season. The boys defeated both schools as well but will place second in league ending a streak of 6 championships in a row. Next week, championship season begins as we have league prelims on Tuesday and league finals on Thursday both at Covina District Field. Cost is $5 for admission 12 and over and $3 for under 12. Gracian Leaves SGV's With Records! When you win your division and nobody has yet to hit the turn in the 1600m, you're doing good things! 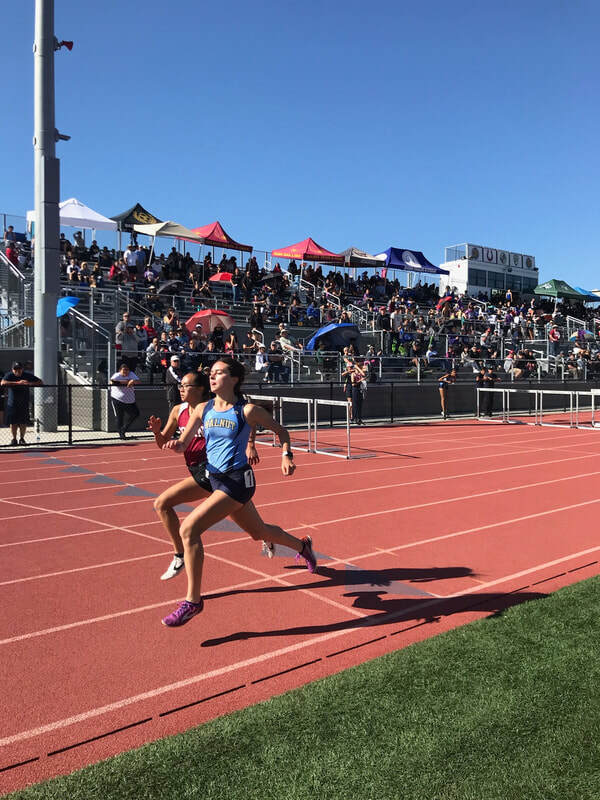 That was the case with sophomore Vanessa Gracian as she dominated her frosh-soph division and events (1600m & 3200m) cruising to two meet records at the San Gabriel Valley Championships Saturday. Overall, the team tuned up well prepping for the last meets of the regular season before heading off to CIF competition. This week the team takes on Nogales and San Dimas on Wednesday at Covina District Field 3:15pm start. In a tightly contested meet on Wednesday, the Covina Girls defeated Rowland 75-61 while the boys narrowly lost 70-66 to the Raiders. 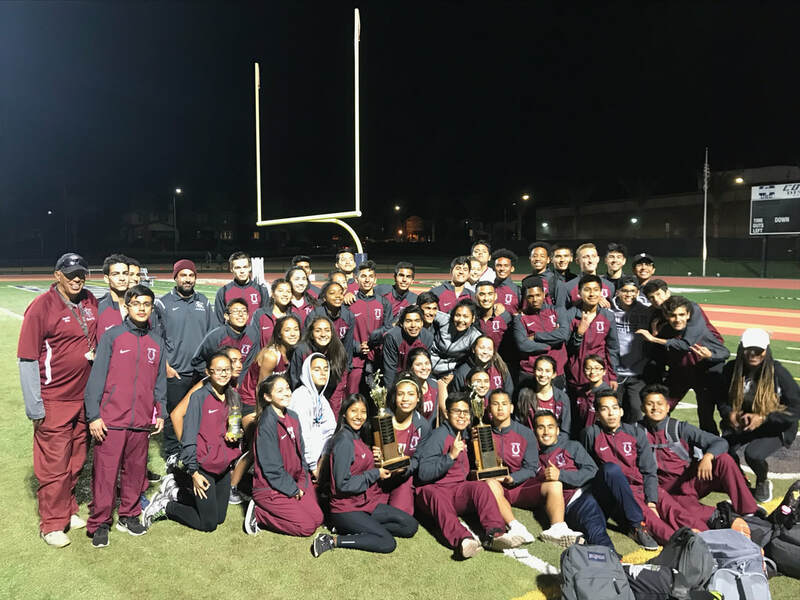 The wins place the girls team in first place while the win for Rowland on the boys side secures first place for them snapping a 6-year league championship for Covina Boys Track. The meet was filled with ups and downs, great performances and also a great finish. 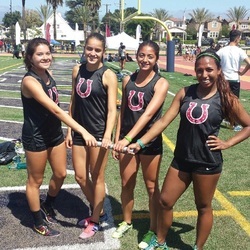 The team continues competition on Saturday at the San Gabriel Valley Championships. Distance Rolls at Mt. Sac! The backbone of Covina Track this season has definitely been the long distance runners. They continued their historic season by breaking more records at the Mt. Sac Relays. The day was highlighted by the girls 4x1600 relay team of Vanessa Gracian, Natali Contreras, Izabella Silva, and Demi Marine who placed 2nd in the seeded race to increase their dominating school record. The shuttle hurdle team of Anthony Vu, Leo San Nicolas, Hakim Williams and Alejandro Brown also ran well placing 3rd in the 4x110 shuttle hurdles. In the Colts first away dual meet of the year, Covina outpaced and outraced the Wildcats of Wilson to victories! The meet was the last to be held on Wilson's dirt track which goes under construction this month. Wilson, who always is a formidable opponent with the team depth and tradition, battled the Colts back and forth in many areas. This weekend some of the team will compete in the prestigious Mt. Sac Relays which we be held at Cerritos College while their stadium also goes under construction. The Dream at Arcadia Continues! One of the greatest high school track honors is being able to qualify for the Arcadia Invitational. The Arcadia Invite brings together the best athletes from across the country into one packed, intense, and exciting weekend of competition. The Colts were fortunate enough to have Daniel Salazar, a sprint medley team of boys, and a girl's 4x1600m relay team qualify for the meet. The girls team was able to increase their school-record 4x1600m relay time. Vanessa Gracian, Demi Marine, Natali Contreras, and Izabella Silva ran with the excellent competition provided and stepped up to the challenge. Girls Take Covina Invite Title! In another awesome day at the 25th Annual Covina Invitational, the team placed in all three divisions with the girls taking first out of the 25 schools in attendance. The boys varsity took 3rd and the boys f/s team took 2nd. The girls were led again by stud senior distance runner Demi Marine who was named Co-Athlete of the Meet for winning the 800m (school record 2:21.51) and 3200 while also running anchor on the 4x400 team (3rd Place). Teammate Daniel Salazar nearly broke the 800m school record too. He was less than a second off the time. 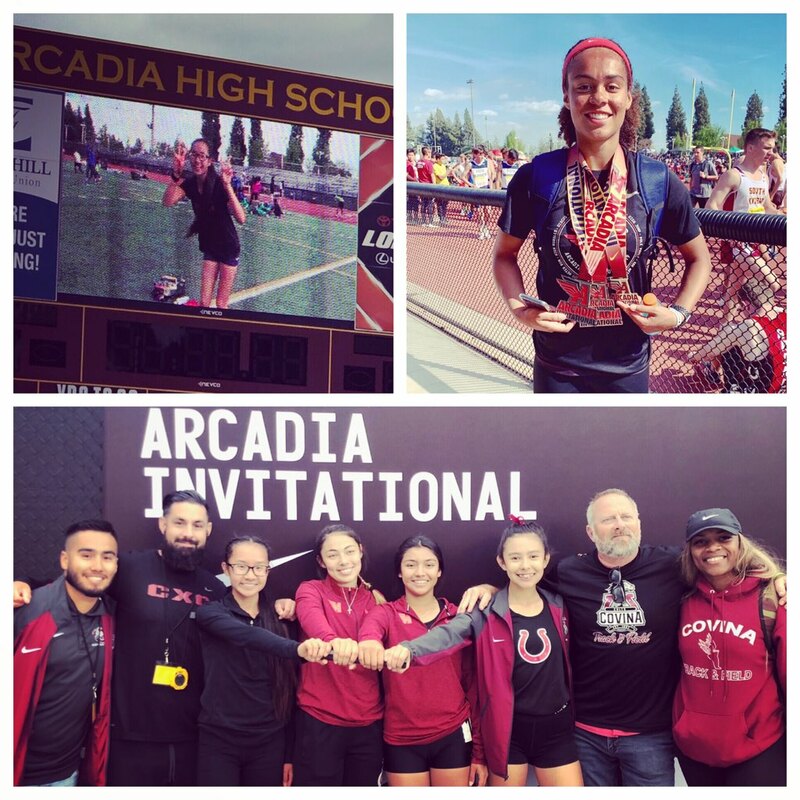 This week the Colts have a bye week but Marine, Salazar, and some distance teammates will get to participate in the prestigious Arcadia Invitational next weekend. 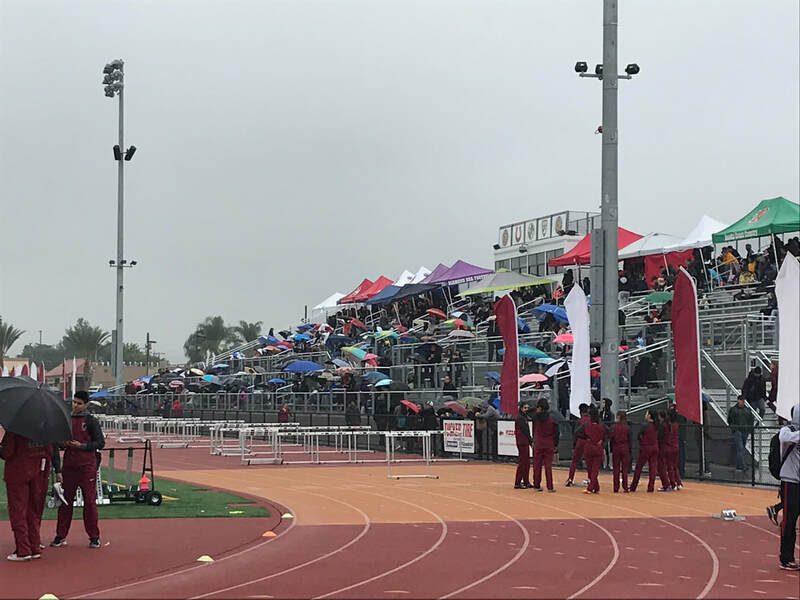 Records Set and Broken at "The Qualifier"
In the inaugural "The Qualifier" meet at Covina District Field over 1000 athletes came to improve marks, set records, and enjoy the great facility in this mid season meet. 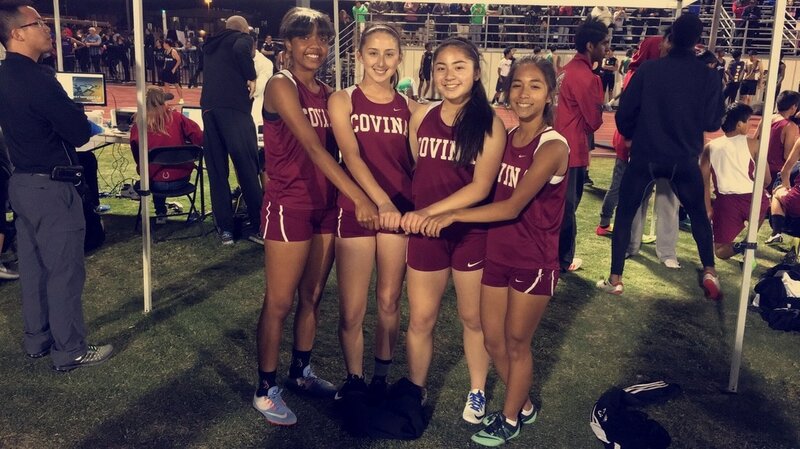 Covina girls distance runners set two new school records one in the 4x800 and the other in the 4x1600. Demi Marine, Izabella Silva, Victoria Covarrubias, Natali Contreras, and Vanessa Gracian were part of the record setting day. The Colts start spring break this week with practices at 9am on Tuesday, Wednesday, and Thursday (District Field Practice). "The Qualifier" Meet this Saturday! UPDATED TIME SCHEDULE BELOW! Colts Beat Northview to Open Up League! 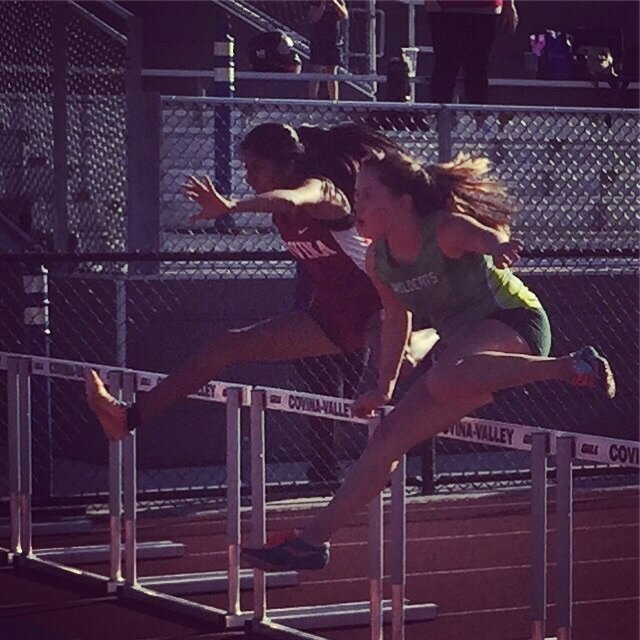 Covina Track opened up league competition with a decisive victory over Northview on all three levels. Dominating in the hurdles and sprints, the Colts depth was just too much for the Vikings. 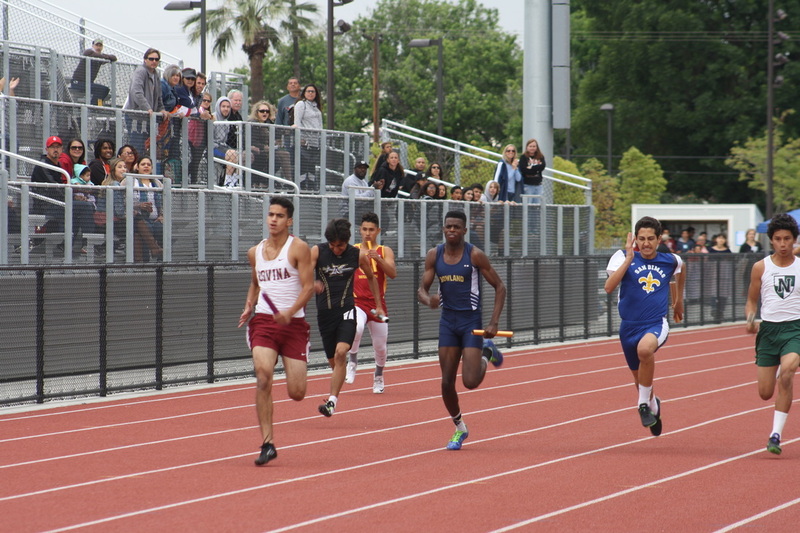 Chino Relays is arguably one of the most favorite meets of the year for the Colts with its abundance of medals, fun races, and team competition. The team left no doubt behind as they once again took first in their favorite meet claiming the boys varsity and girls varsity titles for division 2. They also captured the sweepstakes trophy for best combined boys and girls team score. Hakim Williams was named field event athlete of the meet for his two 1st place and two 2nd place team finishes. This week the team takes on Northview at CDF on Wednesday and hosts "The Qualifier" at CDF on Saturday! 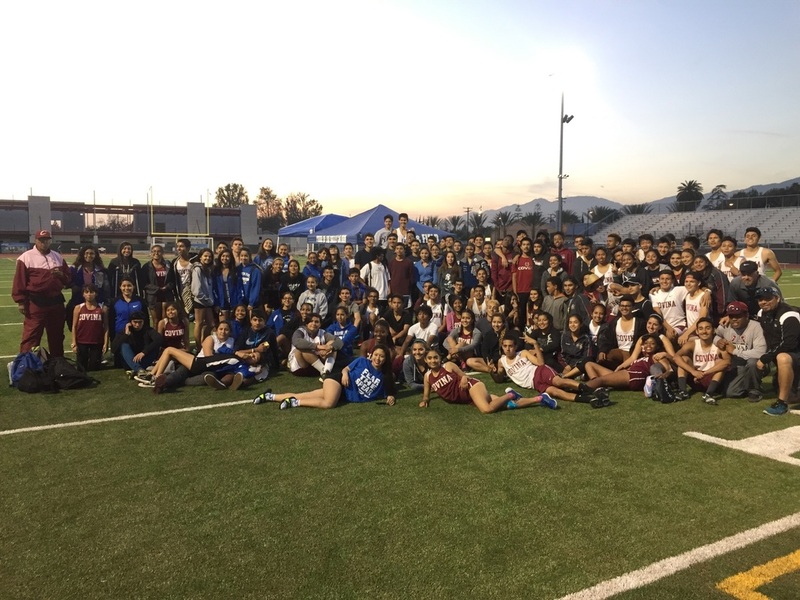 On Wednesday the Colts and Braves reunited their once league rivals and both teams enjoyed the dual meet at the new Covina Valley District Stadium. Covina came out on top on all levels but the story is Baldwin Park will be returning to the Valle Vista League next year to resume the rivalry. Both teams fared well with some excellent marks and look forward to some fun and competitive meets in the future. Below are the results from the meet. Colts Take Awards at Cougar Classic! The Colts entered their first scoring invitational with high expectations and finished with high results! The girls FS team took 1st (tie), boys FS 2nd, boys varsity 3rd, and the girls varsity took 7th! Overall the team excelled in many events and showed their strength in their youth. The future looks bright for the Colts as many 9th/10th graders got to play the big fish role in an invitational competing frosh-soph when many are thrust into varsity competition during the week. District Dominance Belongs to CHS! 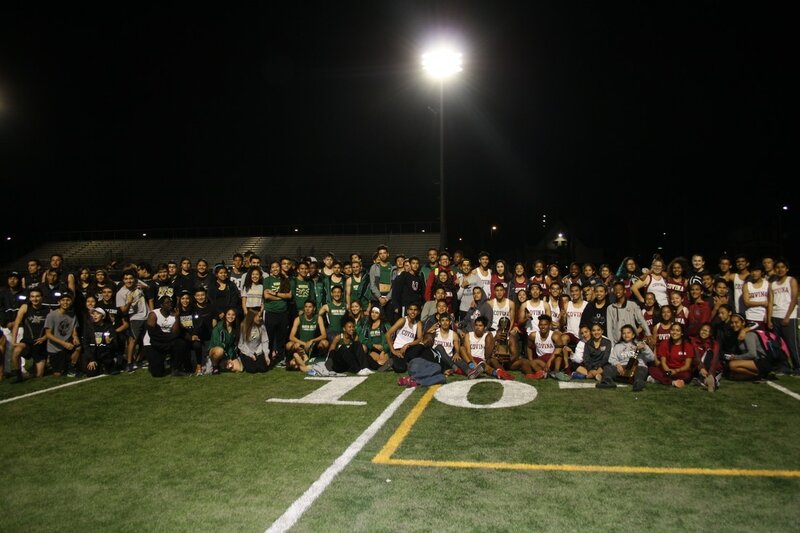 In a battle between district schools Northview, Covina, and South Hills on who would earn the track titles there was no doubt left after the evening the Covina remains the "Track School" of CVUSD. Boys F/S, Girls Varsity, and Boys Varsity all took 1st place in the tri-meet with many outstanding performances. The distance team plans to carry the team on their shoulders and they essentially dominated those events! Things look promising as the team ventures to more invites and preseason meets in the next couple of weeks. Below are the results. Colts Ride High at Saddle Up Invite! All Comers at APU Tunes Up the Team! On another perfect Saturday in February, the Colts tuned up at Azusa Pacific getting ready for the season to begin next week. There were many solid performances led by Cesar Nava, Hakim Williams, and Rosaly Castorena. Next week the team will head to the Bronco Invitational at Vista Murrieta High School to begin the season. 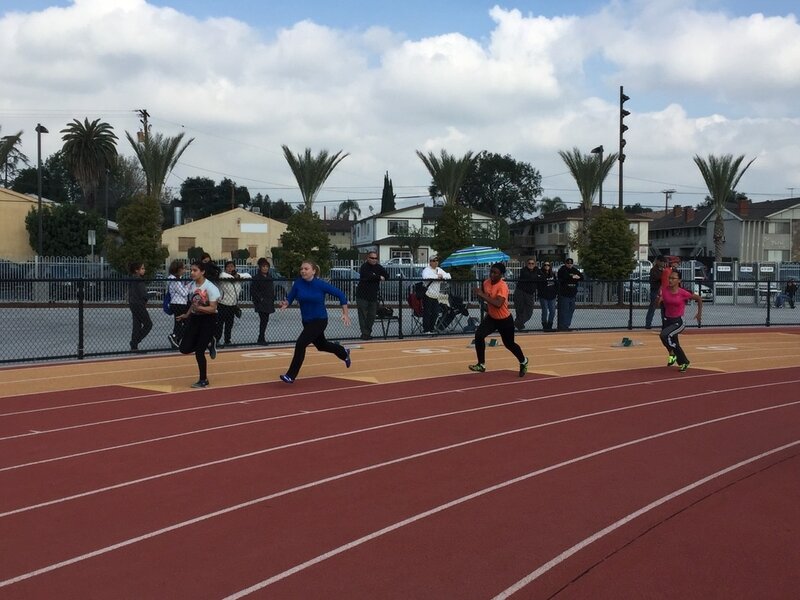 Covina District Field Hosts First All-Comers! 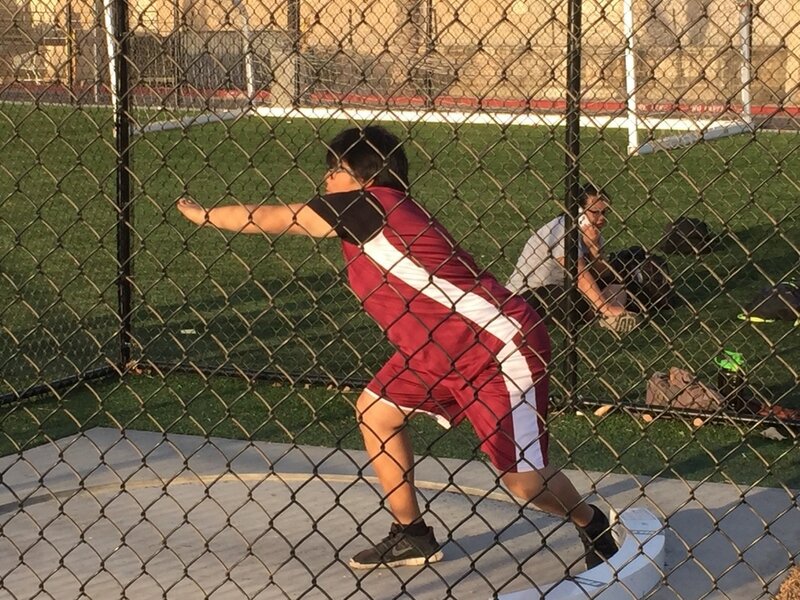 On a perfect February day, the Covina Colts track team started its preseason tune-ups with the first all-comers and track meet at Covina District Stadium. The facility, which still is under construction for snack-bars, locker rooms, and permanent restrooms was still a very viable fast site for excellent times today, including a school record! Demi Marine broke the school record in the 3200m in her first track event of the season (11:33). 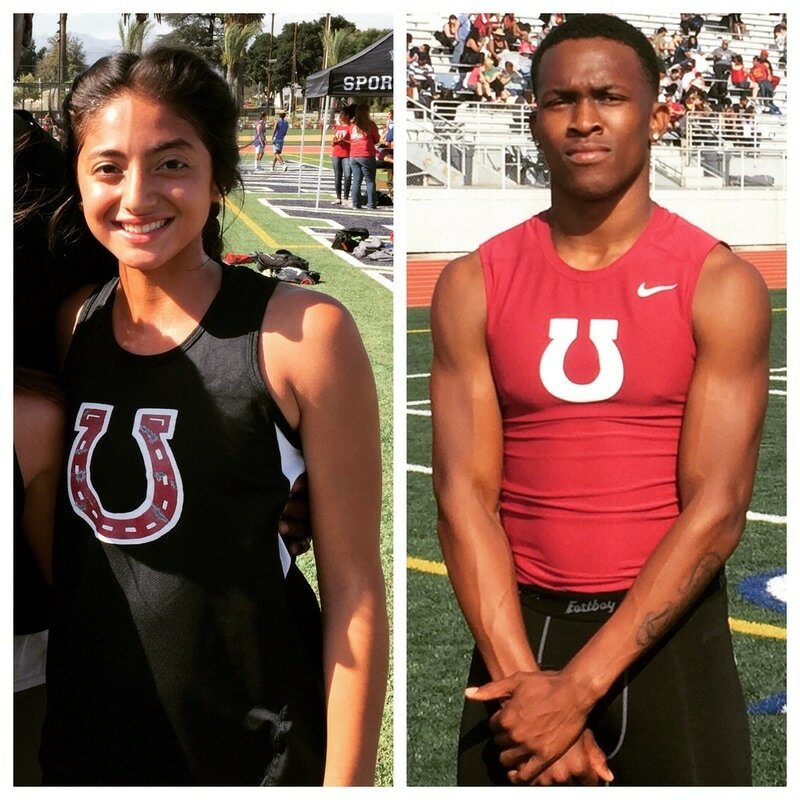 Also performing well today was Melissa Mendoza (5'0") in the high jump, and D'Juan Shamburger in the 400m (49.93). Next week, Covina will host another all-comers, this time Azusa Pacific will be the site. Results from the meet are below! Colt Day Registration Form and Flier Below! Covina Track & Field Gear... 2016! Order form coming soon! Pick up on 12/5/15 at CHS! Same Day Xmas Sale Too! Come Get a Treeeeeeeeee!